A boiler is used to heat water that is circulated through a closed loop piping system for general facility and service water heating. Low-temperature systems generally operate below 200 degrees Fahrenheit. Medium-temperature systems generally operate between 200 and 250 degrees Fahrenheit. 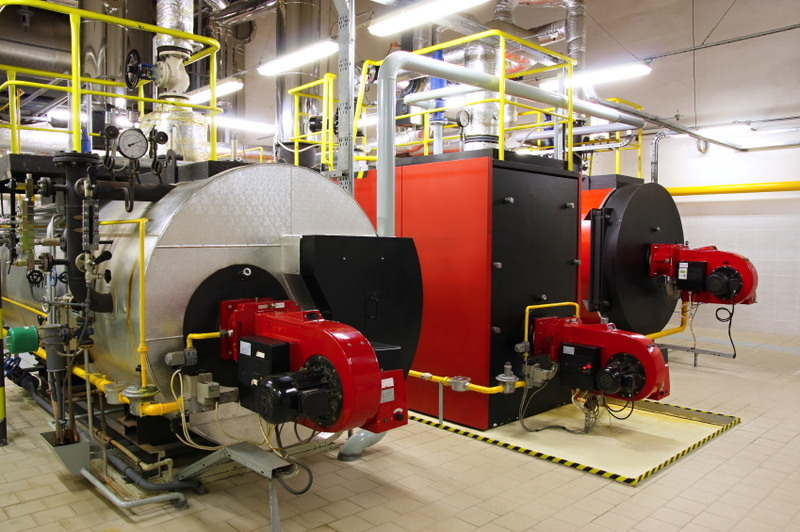 Most facility boiler systems are fired using a combustible gas, fuel oil, or electricity. In many facilities, the boilers are designed to fire both a combustible gas fuel and a fuel oil. In these facilities, the combustible gas fuel is generally natural gas, which is considered the primary fuel, and fuel oil, which is considered to be the backup fuel. In steam and condensate systems, heat is added to water in a boiler causing the water to boil and steam to form. Steam, like any other liquid or gas, flows from areas of high pressure to areas of low pressure. Naturally, the steam pressure is at its highest as it exits the boiler. The higher pressure in the boiler drum forces the steam out through the main steam line. The steam is piped to points requiring its energy and, as the heat and pressure are transferred from the steam to the various plant equipment or processes requiring steam energy, it condenses to form condensate, which is transferred via the condensate system. The condensate system is at atmospheric pressure. In some low-pressure, saturated steam heating applications, the steam distribution piping may be sized to slope back to the boiler so that the steam distribution piping also acts as the condensate return piping (single-pipe system). In other low-pressure applications, there may be steam supply piping and condensate return piping (two-pipe system); although, the condensate system is open to the steam system. As heat is transferred from the steam, condensate is formed and collects in discharge legs. Once enough condensate is present to operate a steam trap, the condensate is drained to a smaller condensate receiver or directly to the central condensate receiver. The condensate is then pumped from the central condensate receiver to the boiler by a series of pumps in the condensate-feedwater system. The amount of steam flowing from the boiler and the amount of water pumped back to the boiler must be equal. 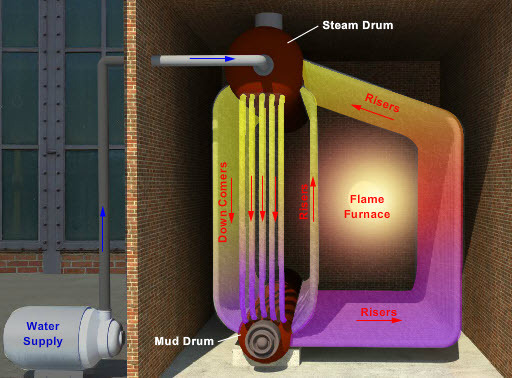 Since the steam cycle is a closed loop system, losses due to leaks, blowdown, and blow-offs due to excess pressures, have to be replaced to maintain a desired water level in the boiler’s steam drum. Consequently, makeup water must be added as needed to the boiler water system. There are two general types of boilers: fire-tube boilers and water-tube boilers. A fire-tube boiler’s main components include a cylindrical shell, a series of tubes, a feedwater inlet line, and a combustion gas outlet stack. The name “fire tube” is very descriptive. The fire, or hot flue gases from the burner, is channeled through a group of steel tubes that are surrounded by a shell filled with water. Every set of tubes that the flue gas travels through before making a turn is considered a “pass.” Since, in this example, the gases pass through the shell two times before exiting, this boiler is called a two-pass boiler. Due to their efficiency and reliability, fire-tube, or shell, boilers are suitable for steam-intensive industries and continuous or batch operation. A water-tube design is the exact opposite of a fire tube. Here, the water is inside the tubes and the combustion gases pass around the outside of the tubes. 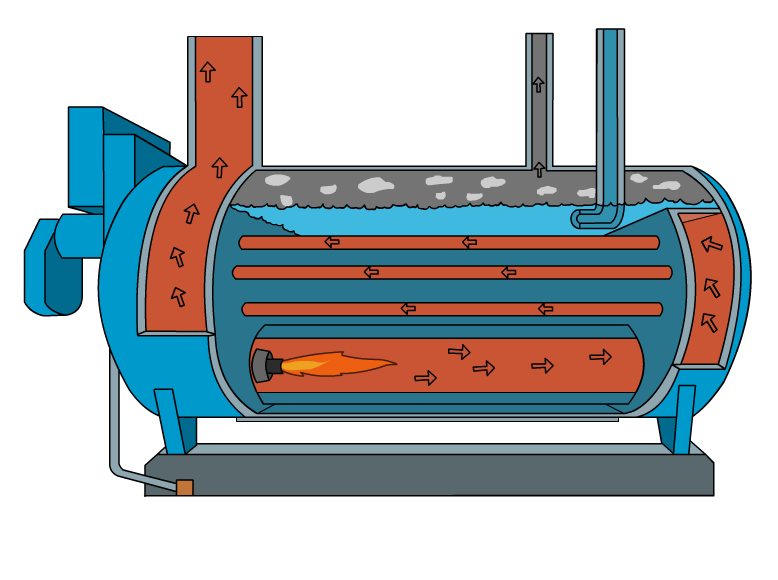 Water-tube boilers may vary in design; however, their basic principles of operation are the same. This type of boiler consists of two drums, a series of water tubes, a feedwater inlet line, and a combustion gas outlet stack. These tubes are connected to a steam drum and a mud drum. The water is heated and steam is produced in the upper drum. Water-tube design boilers are better suited for applications requiring large amounts of steam, such as industrial process applications, and are used less frequently for heating applications.